Blake Lively looked relaxed when returning to her hotel on Monday in New York City. The 30-year-old actress rocked a matching pant and blazer ensemble from Vivienne Westwood‘s Fall 2018 RTW collection. You can buy her distressed blazer for $1,425 at Vivienne Westwood. She paired her dusty-pink suit with two-tone Crapadonna studded oxfords from Christian Louboutin‘s 2017 Collection. Blending a borrowed-from-the-boys shape with feminine detailing, “Crapadonna” is the ultimate garconne look. 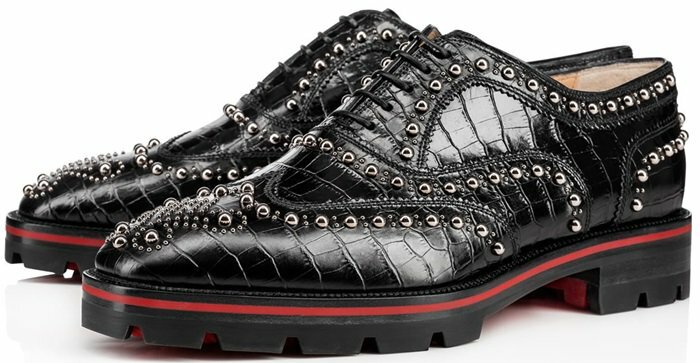 In crocodile embossed leather, this brogue studded oxford is finished with a Loubi red lined lug sole. Later the same day, Blake Lively joined Cardi B, Jennifer Lopez, Blac Chyna, and Amber Rose at the 2018 MTV Video Music Awards on Monday night at Radio City Music Hall in New York City. The American ‘The Shallows’ actress, who presented during the awards ceremony, donned a stunning Ralph & Russo Fall 2018 Couture ensemble and accessorized with Lorraine Schwartz jewelry.